There's something happening here, but you don't know what it is. Watched Fractured Fairy Tales as a kid on KTVU Channel 2 (Jack London Square, Oakland, CA). It was hosted by the sweetest man, Hans Conried. Wow, thanks for the "ping". "Watched Fractured Fairy Tales as a kid on KTVU Channel 2 (Jack London Square, Oakland, CA). It was hosted by the sweetest man, Hans Conried. Wow, thanks for the "ping"." Hans Conried voiced Snidely Whiplash. FFT was narrated by Edward Everett Horton. Fractured Fairy Tales. Now known as the Main Stream Media. Fun Fact, Hans Conried was also in the 1957 flick "The Monster That Challenged The World"
I'm also pretty sure it was Edward Everett Horton, and not Hans Conreid. Conreid was a prolific actor who played Danny Thomas's "Uncle Tonoose". But I remember him best from his "One Minute Mysteries" on the radio, in which there was usually a single clue that solved the case; in one, a big game hunter had been murdered, and a witness said that he'd recognized the murderer as "one of the bearers from our African tiger hunt." Since there are no tigers in Africa, that was an obvious lie, and it was the witness himself who was the killer. The show was Fractured Flickers. And yes, it was Edward Everett Horton. 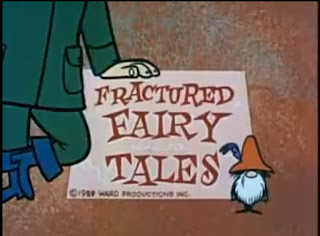 Fractured Fairy Tales was an animated segment of the Rocky and Bullwinkle Show. Written by A. J. Jacobs, narrated by Edward Everett Horton. Over 90 stories. Fractured Flickers was a half-hour show produced by Jay Ward (of Rocky and Bullwinkle fame,) where they took old movies, threw out the sound track, and added new dialog. Voices were done by Hans Conried, Paul Frees, June Foray and Rose Marie, among others. Even in my young years, I knew Fractured Flickers was probably the funniest thing on television, definitely funnies than most things in TV today. Murphy(AZ)- Thank you. For the all "knowledge" shared here, you Sir, are correct. It was as you stated, Fractured Flickers, and my childhood memory must have been foggy. So thanks! What I was testing is how to do a ROLLOVER using this new piece of crap Blogger Format! So no rollover but a sure click over.